Secrets Excellence Punta Cana Swim-out Suites offer the luxury and romance of all other suites at Secrets Excellence Punta Cana all inclusive resort with the added convenience of the pool being connected directly to the room’s patio. These ground level suites allow for quick access to the entire resort via the pool. Bring your vacation experience to a new level with this decadent detail. 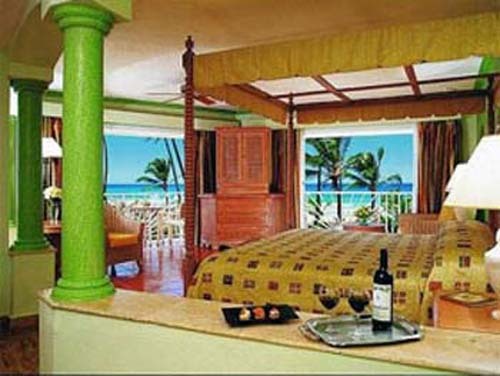 All suites at the resort are furnished with a luxurious four post canopy bed. Each room is equipped with a two-person Jacuzzi and balcony for a truly romantic experience. A separate shower and bathrobe are also provided for your comfort. All suites are equipped with a mini-bar restocked daily with soft drinks, beer, and water. Other conveniences include safety deposit box, satellite TV with HBO and Cinemax, hair dryer, coffee maker, telephone, iron and ironing board. 24-hour room service is available to all rooms at Secrets Excellence Punta Cana. Air Conditioning is available in all suites.